NEW YORK (WLS) -- A giant 227 lb. painting, believed to be the largest cat painting in the world, has sold at auction for nearly a million dollars. 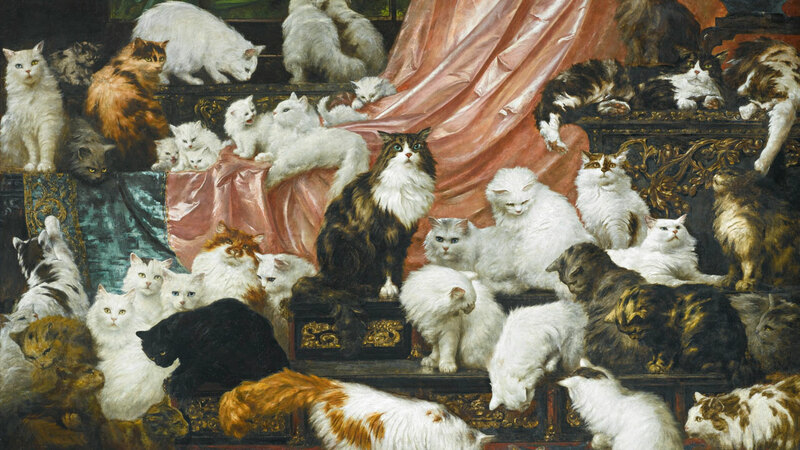 Carl Kahler's "My Wife's Lovers" features 42 cats on a 6-foot-by-8.5-foot canvas. The massive painting "pulled the nails right out" of the wall when it was first mounted, Polly Sartori, Sotheby's head of 19th-century European art, told ABC News. It recently sold for $826,000, well above its pre-auction estimate of $200,000-300,000. The painting was commissioned in 1891 by millionaire Kate Birdsalle Johnson, a San Francisco socialite who owned 350 cats in her 3,000-acre summer home, according to Sotheby's. The giant herd of cats was attended to by a "troop of servants," and were entertained by parrots and cockatoos. Each cat reportedly responded to its own name, and came when called. Johnson's husband jokingly called the painting "my wife's lovers," and the name stuck. Carl Kahler took more than three years to complete the painting, which features "Sultan" prominently in the middle, a cat which cost Johnson the equivalent of nearly $78,000 when she bought him in Paris. Johnson stipulated in her will that $500,000 of her fortune was to go to the "perpetual care and comfort" of her cats.